As I’ve done before (see also here), here are a few sentences from the Armenian synaxarion together with Bayan’s French translation. I’ve made a few notices of the Armenian vocabulary, too, ad usum scholarum. The story here (for 24 Hrotic’/30 July) is the martyrdom of Goharine and her brothers (nothing in BHO; summary in English here), set, it seems, in the twelfth century. The PO text (21: 795-799) and FT is here. Leur père David fut emmené captif par les Musulmans qui le convertirent à leur religion ainsi que son fils aîné. Իսկ մայրն իւրեանց հաստատուն եկաց ի հաւատսն որ ի Քրիստոս, եւ բարեպաշտութեամբ սնոյց զորդիս իւր. homme d’un naturel bestial, assoiffé de sang, et fou furieux contre les chrétiens. Ce sont les enfants d’un musulman, qui ont abandonné notre religion, vivent en chrétiens, répugnent à nos mets et ne prient point avec nous. Ratios se retira dans un couvent et se fit religieux. …il ordonna de creuser la terre et d’y enterrer Gohariné jusqu’à la taille, et commanda à toute la foule de lui lancer dex flèches. L’infidèle, irrité, ordonna de noyer Gohariné dans les eaux du torrent et d’introduire en sa présence Tounkios, Dsamidès, puis d’enserrer fortement Ratios dans des lanières et de le frapper. …si tu nous laisses vivre en chrétiens, nous te servirons fidèlement; dans le cas contraire, ne nous fais plus de questions: nous sommes chrétiens; fais ce que tu as à faire. Les ayant menés au lieu de l’exécution, ils tranchèrent la tête au bienheureux Ratios. Mais la tête tranchée parla à ses frères et les encouragea à ne point craindre la mort. On the form սնոյց. The 3s aor ends in -ոյց, the 1s being -ուցի. For the alternation ոյ/ու (see Meillet, p. 18; Godel §2.222), cf. լոյս light, with gen/dat/abl լուսոյ; that is, -ոյ- in closed syllable, -ու- in open syllable. Ex 2:9 եւ ասէ ցնա դուստրն փարաւոնի. ա́ռ զմանուկդ, եւ սնո́ ինձ զդա. եւ ես տաց քեզ զվարձս քո։ Եւ ա́ռ կինն զմանուկն՝ եւ սնոյց զնա։ εἶπεν δὲ πρὸς αὐτὴν ἡ ϑυγάτηρ Φαραω Διατήρησόν μοι τὸ παιδίον τοῦτο καὶ ϑήλασόν μοι αὐτό, ἐγὼ δὲ δώσω σοι τὸν μισϑόν. ἔλαβεν δὲ ἡ γυνὴ τὸ παιδίον καὶ ἐϑήλαζεν αὐτό. 1Sam 1:23 Եւ նստա́ւ կինն եւ սնո́յց զորդին իւր՝ մինչեւ հատոյց զնա ՛ի ստենէ։ καὶ ἐκάϑισεν ἡ γυνὴ καὶ ἐϑήλασεν τὸν υἱὸν αὐτῆς, ἕως ἂν ἀπογαλακτίσῃ αὐτόν. Acts 7:21 եւ յընկեցիկն առնել զնա՝ եբարձ զնա դուստրն փառաւոնի, եւ սնոյց զնա ի́ւր յորդեգիրս։ ἐκτεϑέντος δὲ αὐτοῦ ἀνείλατο αὐτὸν ἡ ϑυγάτηρ Φαραὼ καὶ ἀνεϑρέψατο αὐτὸν ἑαυτῇ εἰς υἱόν. While the above pages were in the press, the authorities of Harvard University — to whom I here take the liberty to tender my sincerest thanks — were so kind as to place at my disposal, through the intermediary of my friend Dr. Rendel Harris, a manuscript described as “Harvard University Semitic Museum No, 4019,” and containing all the controversial works of Barsalibi mentioned by Baumstark in his Geschichte der Syrischen Literatur (p.297). This MS. formerly belonged to Dr. R. Harris in whose collection it was numbered 83. On fol. 47b we are informed that it was transcribed in Mardin, Saturday, 14th March, 1898, by the priest Gabriel, from a MS. dated 1813 of the Greeks (A.D. 1502) and written in the monastery of Mar Abel and Mar Abraham, near Midyad, in Tur ʿAbdin. Let the reader pray for ʿAz(iz) — the miserable, the sinful, the weak monk, “Son of the Cross” [bar ṣlibā], monk of Midyat, from Ṭur ʿAbdin — who has copied [this book] in the Monastery of Mar Abel and Mar Abraham, the teacher of Barṣawmā, that is near the ble(ssed) city of Midyat, in the year 1813 AG, at the beginning of the month of Ēlul [September] on the memorial [lege dukrānēh] of Mar Malke of Clysma. (See Fiey, Saints syriaques, no. 282, where one of Mar Malke’s commemoration days is given as Sept. 1.) The colophon continues with a notice of some clerical happenings of the place and time not relevant to the present focus, but those interested in early 16th-century ecclesiastical history in Ṭur ʿAbdin will probably find some things of interest and value. There are several more colophons in the manuscript (pp. 287, 307, 591, 665, 781-782), the later ones having the date 1814 AG. It appears, then, that the manuscript before us is the one on the basis of which Harris’s late 19th-century copy, now Harv. Syr. 91, was made, and indeed a cursory look at the readings of the Harvard copy as reported by Amar confirm the fact. The manuscript was formerly at nearby Dayr Al-Zaʿfarān, as evidenced by the still present bookplate at the beginning of the codex, and Dolabani lists its contents in his catalog (olim no. 98, see pt. I, pp. 376-397). The manuscript itself has hardly been widely accessible in recent years, and Dolabani’s catalog (in Syriac), itself formerly not commonly available (but reprinted by Gorgias Press) and even where available not so usable as might be hoped for due to faults in the printing process and Dolabani’s sometimes unclear handwriting, and although the indefatigable Vööbus, of course, knew the Dayr Al-Zaʿfarān/Church of the Forty Martyrs collection well, he does not (as far as I know) make much (or any?) notice of this important manuscript. It has, however, not been wholly unknown. In the introduction to his edition of the Response to the Arabs, Joseph Amar has the following to say: “A further manuscript, Mardin Syriac 350 (unfoliated), which contains one-sentence summaries of the contents of each chapter of the treatise, has also been consulted in the preparation of this edition” (vi-vii). This statement calls for a few remarks. It must be made clear that the manuscript does have those one-sentence summaries, but this is merely the beginning of the book: the remainder of it consists of the full treatises themselves, along with some related works by other authors. The reference to this copy in his introduction is distinct from the other five manuscripts he used for his edition in that those each have a siglum, while the Mardin manuscript does not, and the latter seems to have been used in the edition much less indeed than the other manuscripts listed. He does not say how he consulted this copy (on-site in Mardin, photographs, microfilm?). The manuscript is indeed unfoliated, as he says, but at least when it was photographed by HMML in 2007, it was paginated with eastern Arabic numerals. How CFMM 350 is related to the other witnesses to Bar Ṣalibi’s polemical treatises will require closer comparison, but it will at least displace Harv. Syr. 91 in that list, since it is the Vorlage, and its antiquity is nothing to ignore, the only older witness (only of the Response to the Arabs, not the other treatises) being Vat. Syr. 96 (Dec 1664 AG = 1352 [1325 in Amar’s ed. is an error]; Assem. Cat., p. 523), and that copy is incomplete. In terms of its text as well as some apparently contemporaneous marginal notes, CFMM 350 deserves close inspection by anyone interested in Bar Ṣalibi’s polemical treatises. Amar, Joseph P. Dionysius bar Ṣalībī, A Response to the Arabs. CSCO 614–615 = SS 238-239. Louvain, 2005. Assemani, S.E. and Assemani J.S. Bibliothecae Apostolicae Vaticanae Codicum Manuscriptorum Catalogus. I.2. Rome, 1778. Brock, S.P. “Dionysios bar Ṣalibi.” In GEDSH, 126-127. Piscataway, 2011. Dolabani, Yuhanna. Catalogue of Syriac Manuscripts in Zaʿfaran Monastery. Dar Mardin Press, 1994; reprint, Piscataway, 2009. 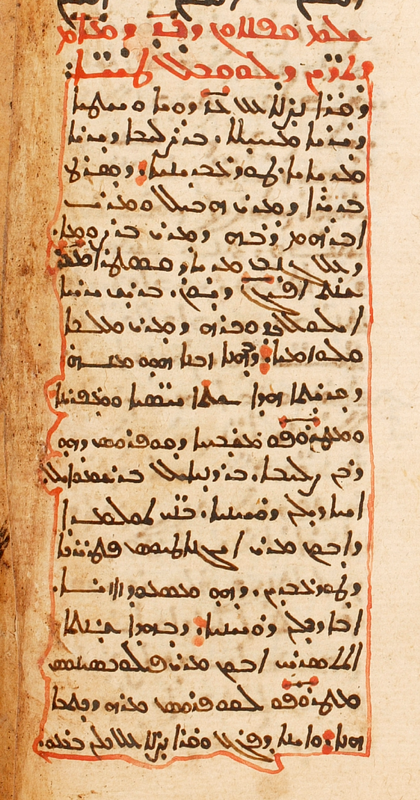 Goshen-Gottstein, Moshe H. Syriac Manuscripts in the Harvard College Library: A Catalogue. Harvard Semitic Studies 23. Missoula, 1979. ADDENDUM: Barsoum (Scattered Pearls, p. 438, with n. 1) mentions CFMM 350 under the name Zaʿfaran 5 (cf. p. 428, nn. 2, 4, p. 439, n. 2).